Under this Bodhi Tree in India, Gautama Buddha is said to have meditated until he had fully realized the philosophy that is the foundation of Buddhism. Getty Images. The Bodhi Tree, a large fig tree located in Bodhgaya, India, is honored by Buddhists as the originating location of their faith. As the story goes, Gautama, the founder of Buddhism, had been engaged in various austerities in his search for enlightenment. After several years of such exercises, he realized their futility and changed his focus. He sat under a tree vowing not to rise until he attained his goal. Here he engaged in various mental disciplines and subdued his mind. He followed his enlightenment with seven days of sitting meditation, seven days of walking meditation, and then seven more days under the tree. In 623 BCE, Gautama emerged from this period as the Buddha, the Enlightened One, ready to deliver his teachings to his close disciples. Over the next centuries, the most famous incident concerning the tree relates to the conversion of King Asoka (third century BCE) to Buddhism. He subsequently found his way to Bodhgaya to meditate by the tree. As the story goes, his angry wife had the tree cut down. Asoka responded by having the tree stump covered with dirt, over which he poured milk. The tree miraculously revived. He later had a stone wall built around the tree’s trunk to protect it. Sangamitta, Asoka’s daughter and a Buddhist nun, took a cutting from a shoot of the tree to Sri Lanka, where the king, Devanampiyatissa, planted it at the Mahavihara monastery in the old capital of Anuradhapura. This tree, derived from the original tree, is now the oldest continually documented tree in the world. A century after Asoka, the original Bodhi Tree was destroyed by King Puspyamitra (second century BCE), although an offshoot of the tree was planted in its place. Then in 600 CE, King Sesanka, a zealous Hindu, destroyed the tree again. A new tree was planted in 620 by King Purnavarma. Little was heard of the tree for many centuries following Buddhism’s destruction in India in the twelfth century. In the nineteenth century, British archeologist Alexander Cunningham visited Bodhgaya on several occasions and documented the destruction of the tree as it was then constituted. Already weakened by rot, in 1876 the last remnant of the tree was destroyed in a storm. Several people had collected the seeds, and in 1881 Cunningham planted a new Bodhi Tree that stands today. That tree is the fourth in lineage from the original tree. With the support of the British colonial authorities, he began a restoration of Bodhgaya. 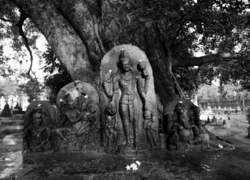 At the time Cunningham replanted the Bodhi Tree, Bodhgaya had fallen into highly partisan Hindu ownership. In the 1890s, Anagarika Dharmapala (1864–1933), a Sri Lankan Buddhist, founded the Maha Bodhi Society for the expressed purpose of raising the money to buy back the Bodhgaya and return it to Buddhist control. That campaign had a partial victory in 1949, when a new temple management committee took control of the site. It is still the case that a majority of the committee and its chairperson must be Hindus, but Buddhists participate. In 2002, the temple at Bodhgaya was named a world heritage site by UNESCO. Today, a number of Buddhist temples around the world have Bodhi Trees growing in or adjacent to them, all of which are believed to be offshoots of the one from Sri Lanka. Nissanka, H. S. S. Maha Bodhi Tree in Anuradhapura, Sri Lanka: The Oldest Historical Tree in the World. New Delhi: Vikas Publishing House, 1996.